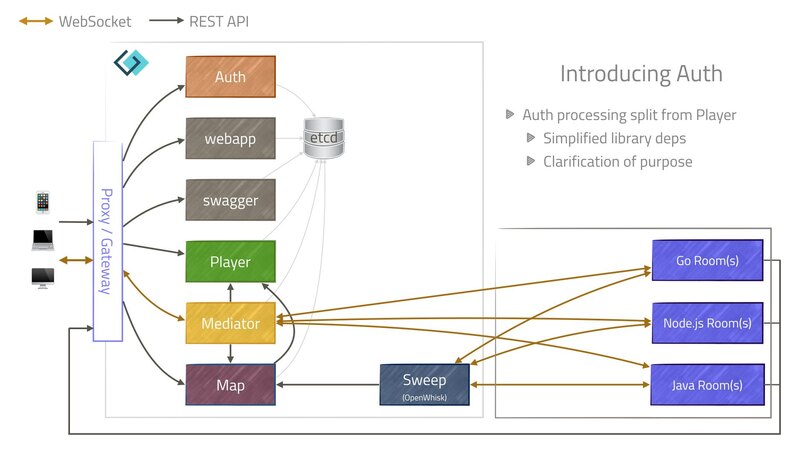 Auth Goes Its Own Way · Exploring Microservices — Game On! Remember way back in the beginning when we had only 3 services total and the Player service did all the things that ever needed to be done regarding players? Well, "all the things" included interacting with Social Login services to authenticate the Player and issue an access token (JWT). As we grew to support additional Social Login services, the dependency management for Player become problematic. 3rd party libraries would require dependencies that would conflict with others required by our core Player entity store function. Can you believe it? We couldn’t. Looking at KeyCloak, Auth0, and other auth-handling gateways, it seemed more natural to have a service dedicated to issuing JWTs in response to Social Login. Lo and behold, a brand new Auth Service was born (more or less via transplant).